Send Spell or Trap Cards on your side of the field to the Graveyard except this card. Increase your Life Points by 1000 points for each card sent to the Graveyard. Not as good as it once was, but it could still see some use. Today, it doesn't have as many combo uses -- it can give you some LP advantage if your opponent rips Heavy Storm, it gives a little boost to chainables such as Waboku, and it saves your monster from getting killed via Premature Burial if they try to get rid of that. Otherwise, I don't see playing this card just to gain LP at the expense of cards on the field. Emergency Provisions is a Quick-Play Magic released in the ages of Legacy of Darkness. To be honest with you, I've never seen it played in my area, and usually we come up with loads of tech. Then again, this doesn't mean its not played at all. I could see it being tech'd in the even that you were going to face a Heavy Storm, flip this, and instead of making the loss a no-gain you turn it into Life Points. This provides no real advantage as far as the field goes. I have little to say on this card, outside of the face its a -X advantage/disadvantage and could be odd tech. Emergency Provisions is possibly the best LP gain card in the game. Why? It is a Quick-Play Spell. 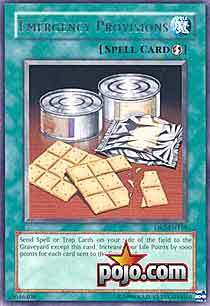 More importantly, it is one that gives you 1000 LP for each Spell or Trap card on your side of the field you “send” to the Graveyard. Separately these things would… well, the Quick-Play Spell part would still be fine, but the second part would render this a desperation card only for Life Gain decks. Together, they work fantastically well. You see, for each non-continuous or Equip Spell/Trap you activate in chain, you can tack this card onto the end and get that much of an LP gain. Although doubtful, you could theoretically use Smashing Ground, chain Mystical Space Typhoon, and then two copies of Dust Tornado and finally this card, sending the previous four to the discard for 4000 LP of gain. Its more likely is that you’ll have this set when your opponent uses Heavy Storm; you can save some face and gain some LP using this on your own cards that are doomed to die anyway. This is also useful if you have Spell/Traps that remain in play that you may need to dispose of yourself at a certain times. In Traditional this would include Mirage of Nightmare; in Advanced you might use Level Limit-Area B or its ilk when you no longer need their services for protection. The latter may seem unlikely, but in a Life Gain deck, it’s not unheard of to use protection like that early on then bring out a something like Guardian Angel Joan. In general, it’s a useful surprise if your opponent is going heavy on S/T removal. One of those cards worthy of being played, but that tend to get squeezed out by cards you “have” to play. After all, you’ll normally end up chaining it to just one card, since if you wait too long, it will probably be hit by a Dust Tornado or something. Traditional : 3.85/5-Okay, here’s where my lack of “current” Traditional knowledge becomes a bit more apparent. It’s no longer commonly played, so it’s hard to tell how good those using “Traditional” decks really are. If you want to abuse Mirage of Nightmare in the classic manner (nuking it before you have to discard) you’ll want to run these. There’s the fact that it makes Chaos Emperor Dragon-Envoy of the End, Harpie’s Feather Duster, and Heavy Storm sting much less. Advanced : 3.45/5-Here there aren’t as many sick combos to abuse, or at least not as potent of one as Mirage of Nightmare. If you have room though, it is a nice little trick. It is also quite nice if Life Gain is important to your deck. Limited : 4/5-I rate it highest here because of the possibility you might want a few S/Ts to bluff. If you had very poor luck, it might be a matter of “filler” (especially if you use older sets). More realistically, however, you’ll get a few S/Ts, and at least one will be as such you can chain Emergency Provisions to it. In a more “primitive” environment, LP gain is proportionately more powerful: they pull off one good “whack” (clearing the field and going direct for 2000+ damage); they probably can’t do it again. Dark Paladin As my week of chosen cards along the theme...continues, we come to Emergency Provisions, a card that is currently semi-restricted, and with good reason. Why, you ask? Well, if you had four magic and/or trap cards on the field, plus a field card, and sent them ALL to the graveyard, you would gain a whopping 5000 lifepoints! Do it twice and you're at a 10000 point bonus. Odds of that happening once, let alone twice isn't that great, but that doesn't mean Emergency Provision is a bad card, not at all. First, it's quickplay, meaning it's chainable...that equals good. So, you can activate a magic or trap card (or cards) and chain Emergency Provisions. Then, you just gaiined 1000 lifepoitns per card sent to the graveyard. As a bonus, the cards sent to the graveyard STILL get their effects carried out. Is Emergency Provisions for EVERY deck? Not necessarily, space in your deck becomes quite a key factor. In my opinon, every deck needs a little burn, but every deck should have a little healing. Emergency Provisions is a solid side-deck card at the least. Art: 4/5 The art isn't that cool, but it's definately some Emergency Provisions.